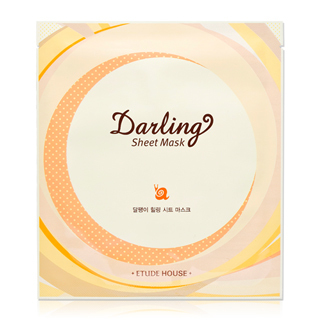 I also bought this mask while I was in Korea and tried it in Korea so I don't have a photo of it myself (picture taken from etude house official website). When I was there, what I would do is buy one mask and use it that same night. If it gave me a good feeling or even better, if I could see the results immediately, I'll go and buy a pack of 10 the next day. Gel essence mask sheet formulated with Snail Secretion Filtrate ingredient to regenerate and to protect skin cells damaged by stress and environment. It is rich in collagen, vitamins, glycolic acid, with additional almond oil, aloe vera and vitamin E, it effectively prevents oxidation and prompts the cell regeneration. Tighten the skin pores, reduce skin redness, provide deep moisturizing, help the skin regains its health and elasticity, provide energy to fatigue skin. I tried this mask AFTER I had bought and tried The Saem's Snail Mask so naturally I compared this one's results to that mask. In terms of effectiveness, when I took the mask off, I didn't feel much of a difference. My face was moisturized and felt refreshed, yes, but I find that most Korean sheet masks give that feeling. It definitely did not even my skin tone, calm the redness under my cheeks where the acne scars used to be, or smooth out the little bumps on my lower cheeks as much as The Saem's Snail Mask or Missha's Super Aqua Cell Renew Sleeping Mask. As to how it adhered to my face. Ugh. This mask was thick. If you read my review about The Saem Chaga White Liposome Mask, thick masks only lead to less flexibility of the mask. This means that any small movement of your face will cause air bubbles to form between your face and the mask. So your skin will not have as much surface area to absorb the essence from the mask. That and you have to keep paying attention to whether it sticks to your face all the time and smooth it out every few minutes. I like to multitask when I am doing masks so this was very distracting for me. And because of the thickness and lack of flexibility of the mask, I didn't feel very comfortable and it felt like it was going to fall off. As for absorption, I could definitely feel the essence on my face and that my face was moisturized. But at the same time I didn't see much effect.. and that may be because it didn't absorb well. But that's because the sheet mask itself is thick and not flexible making it prone to create air bubbles upon the slightest movement of my face! Yes, I do believe those two things are important points to consider in order for a mask to be effective. Also, I'm not sure if I just didn't encounter a sale but that mask was $4! That's pretty expensive for a mask that isn't very effective. And it's almost $7 on eBay. Definitely not worth it in my opinion. Value: 1/5 because it's way too expensive for one mask! !